Air Date: 06/07, same day as Verano de Escandalo. Sin Cara goes from the three best guys to work with him to his three biggest rival. Again, I think they’re much better off announcing him then playing the mystery game (assuming he’s signed.) I’m hoping there’s something along the lines of a DF press conference where Sin Cara is officially signed and Averno shows up to challenge him to get the word out. Fenix being in the main event both nights is really interesting. Fenix is going to blow Sin Cara away, at least in athletic feats. Sin Cara’s history and aura are tough to over shadow, but I wonder how many people are going to walk away from both matches believing Fenix is the more dynamic exciting luchador. Aerostar was previously announced as working in UK on 05/25. This was announced last month, so AAA should be aware of it – like with Bengala, maybe not all the decision makers know what’s going on, but I’m certain someone does. If Aerostar really wasn’t going to the UK, AAA could’ve knocked that down a while ago. They have not. They’ve just listed him here, confusing the issue and making it confusing for fans of Aerostar on either side of the Atlantic. Now I get it: AAA is booking Axel like he’s an exciting cruiserweight luchador. He’s not and I have no idea where they got this idea, but that’s clearly the idea. TIP FOR VIDEO MONTAGE CREATOR: there’s some footage of Axel challenging Daga from a year ago that the people in charge totally forgot about, but you can make good use of here. Let me know if you need help tracking down the taping. That tercera is a multiman, not a trios. 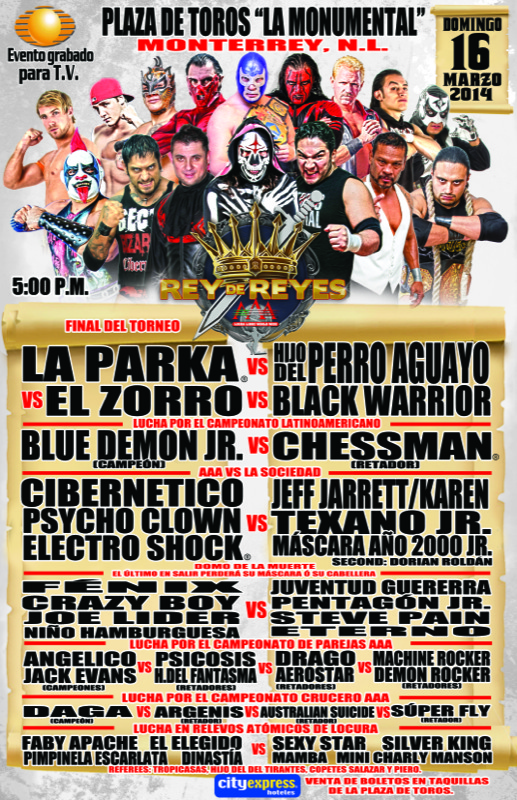 They sometimes list more “vs” to indicate multiman but sometimes don’t; they did it both ways on the Rey de Reyes poster. As listed, and with Axel not messing things up, it had a chance to be one of the best matches of the year. It now depends on who replaces Aerostar (and, at least to me, if they understand their own rules.) Or everyone else can leave and Daga and Bengala Marvin can face off, because that will be very good. Next taping is 06/07, Vernao de Escandalo in Orizaba. AAA’s new practice seems to be releasing TV lineups a couple days after the latest taping, so we probably won’t see that until 05/19. How does Bengala go from beating Perro Jr to being in a undercard title match? @Tim: I don’t know, but I bet Perro is really sad he lost and missed out on this title chance.